Dhaka, 19 Jan, Abnews: Green activist and former US vice president Al Gore has urged Prime Minister Sheikh Hasina to stop building the coal powered plant in Rampal close to the largest mangrove forest, Sundarbans. In a plenary session of the 47th annual meeting of the World Economic Forum (WEF) in Davos of Switzerland on Wednesday, Al Gore said a “dirty coal-fired power plant” (Bangladesh India Friendship Rampal Power Plant) is being “built in the Sundarbans, the largest mangrove forest in the world,” according to a video-clip of Jamuna Television. “...The last remaining tigers preserved. Thousands of people are demonstrating against it. My advice would be, don’t build that dirty coal plant,” Al Gore asked Hasina who was sitting next to him in the programme. In response, the Premier defended the coal plant stating that it is being built far away from the Sundarbans, said a BSS report. "Come to Bangladesh and see for yourself weather the 'plant' affects the environment or not," she said addressing the former US vice president at a session of the meeting on Wednesday. The premier also said that the people opposed to Rampal project could not point out any logical reason as to why and how the plant would affect the environment and even did not respond to her call to visit the plant site either. Sheikh Hasina said her government took all sorts of measures to protect the environment. ‘As I'm the prime minister of the country, nobody is more concerned than me on any issue . . . I won't give permission for any project where there is a possibility of any type of damage,’ she said. Local environmental groups have been protesting against the building of the coal-fired plant in the vicinity of the Sundarbans, arguing that it might damage the world's largest mangrove forest. 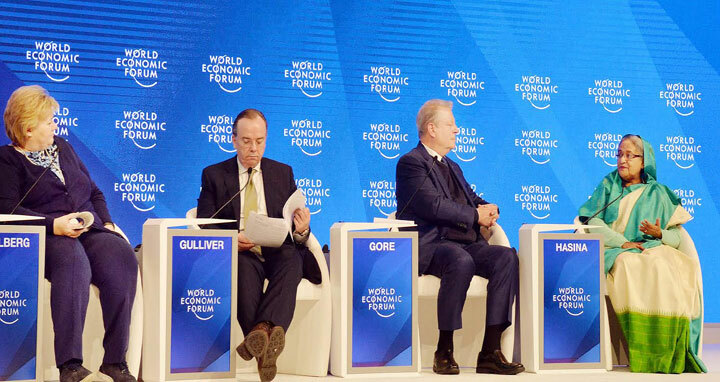 Apart from Sheikh Hasina and Al Gore, CEO of the HSBC Stuart Gulliver, Cofco Agri CEO Jingtao Chi also took part in the plenary session titled "Leading the Fight against Climate Change".